Class C power amplifier is a type of amplifier where the active element (transistor) conduct for less than one half cycle of the input signal. Less than one half cycle means the conduction angle is less than 180Â° and its typical value is 80Â° to 120Â°. The reduced conduction angle improves the efficiency to a great extend but causes a lot of distortion. Theoretical maximum efficiency of a Class C amplifier is around 90%. Due to the huge amounts of distortion, the Class C configurations are not used in audio applications. The most common application of the Class C amplifier is the RF (radio frequency) circuits like RF oscillator, RF amplifier etc where there are additional tuned circuits for retrieving the original input signal from the pulsed output of the Class C amplifier and so the distortion caused by the amplifier has little effect on the final output. Input and output waveforms of a typical Class C power amplifier is shown in the figure below. From the above figure it is clear that more than half of the input signal is missing in the output and the output is in the form of some sort of a pulse. 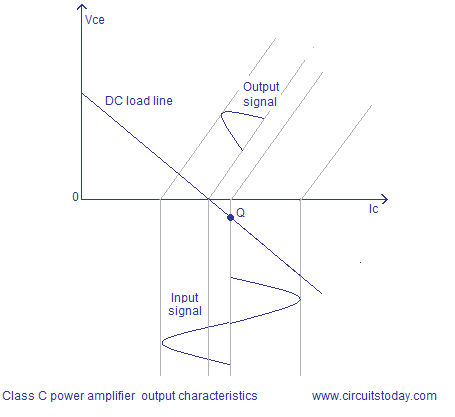 Output characteristics of Class C power amplifier. In the above figure you can see that the operating point is placed some way below the cut-off point in the DC load-line and so only a fraction of the input waveform is available at the output. 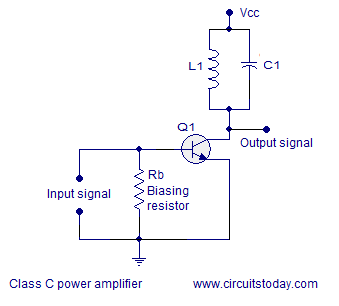 Class C power amplifier circuit diagram. Biasing resistor Rb pulls the base of Q1 further downwards and the Q-point will be set some way below the cut-off point in the DC load line. As a result the transistor will start conducting only after the input signal amplitude has risen above the base emitter voltage (Vbe~0.7V) plus the downward bias voltage caused by Rb. 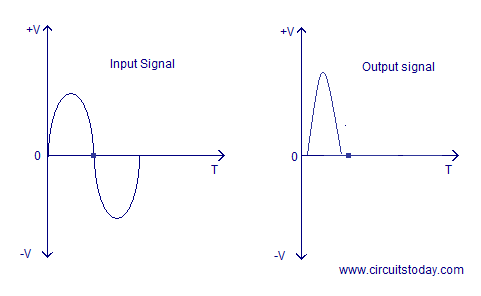 That is the reason why the major portion of the input signal is absent in the output signal. Inductor L1 and capacitor C1 forms a tank circuit which aids in the extraction of the required signal from the pulsed output of the transistor. Actual job of the active element (transistor) here is to produce a series of current pulses according to the input and make it flow through the resonant circuit. Values of L1 and C1 are so selected that the resonant circuit oscillates in the frequency of the input signal. Since the resonant circuit oscillates in one frequency (generally the carrier frequency) all other frequencies are attenuated and the required frequency can be squeezed out using a suitably tuned load. Â Harmonics or noise present in the output signal can be eliminated using additional filters. A coupling transformer can be used for transferring the power to the load. Advantages of Class C power amplifier. Lowest physical size for a given power output. Disadvantages of Class C power amplifier. Not suitable in audio applications. Creates a lot of RF interference. It is difficult to obtain ideal inductors and coupling transformers. Applications of Class C power amplifier. Nicely done explanation, concise, and to the point. Tittu thanks 4 more details.